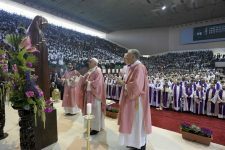 “May the Merciful and Compassionate One – as our Muslim brothers and sisters frequently invoke him – strengthen you and make your works of love ever more fruitful,” Pope Francis said in his homily March 31. Much of the pope’s weekend trip to Muslim-majority Morocco March 30-31 has focused on inter-religious dialogue and outreach to migrants. Pope Francis urged the thousands gathered in the Moroccan stadium for Mass, “Keep close to the little ones and the poor, and to all those who are rejected, abandoned and ignored. Continue to be a sign of the Father’s loving embrace.” Love and compassion are “the greatest legacy and wealth of a Christian,” he said. The pope’s homily centered on Sunday’s Gospel narrative of the prodigal son, who is joyfully welcomed home by his merciful father, but judged by his older brother. 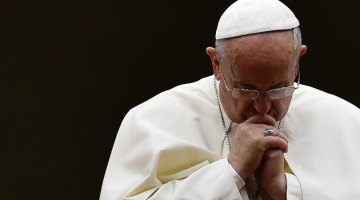 “At the threshold of that home, something of the mystery of our humanity appears,” Pope Francis said. The brother “cannot accept a father capable of forgiving, willing to wait patiently, to trust and to keep looking, lest anyone be left out. In a word, a father capable of compassion,” he said. 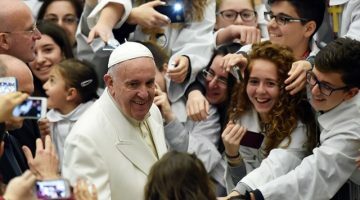 “Aggressiveness and conflicts that always lurk at the door of our high ideals, our efforts to build a society of fraternity, where each person can experience even now the dignity of being a son or daughter,” Francis explained. “Let us not fall into the temptation of reducing the fact that we are his children to a question of rules and regulations, duties and observances,” he said. 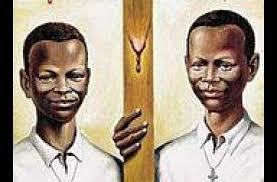 “Jesus invites us, then, to stop and contemplate the heart of our Father. Only from that perspective can we acknowledge once more that we are brothers and sisters. Only against that vast horizon can we transcend our shortsighted and divisive ways of thinking,” he said. “We can imagine that this open ending is meant to be written by each individual and every community. 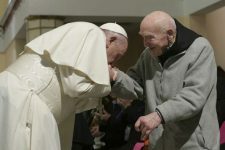 We can complete it by the way we live, the way we regard others, and how we treat our neighbour,” Francis said.